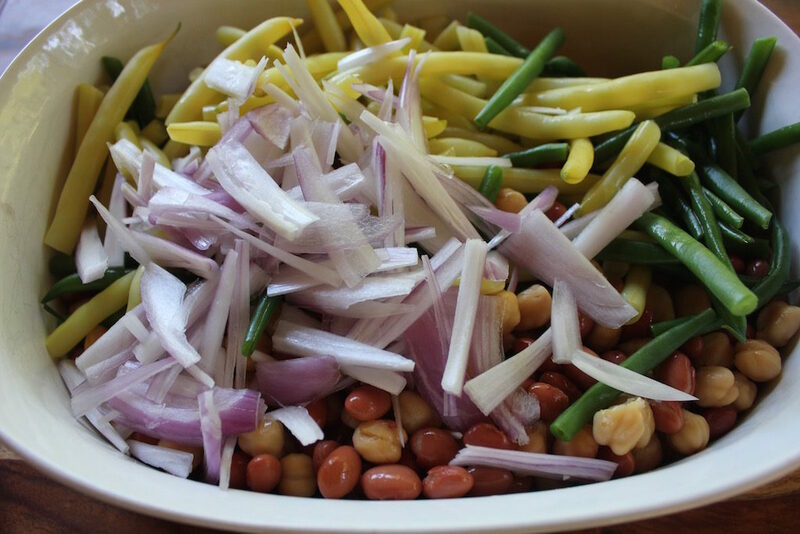 Four Bean Salad is a standard summer dish from my childhood. 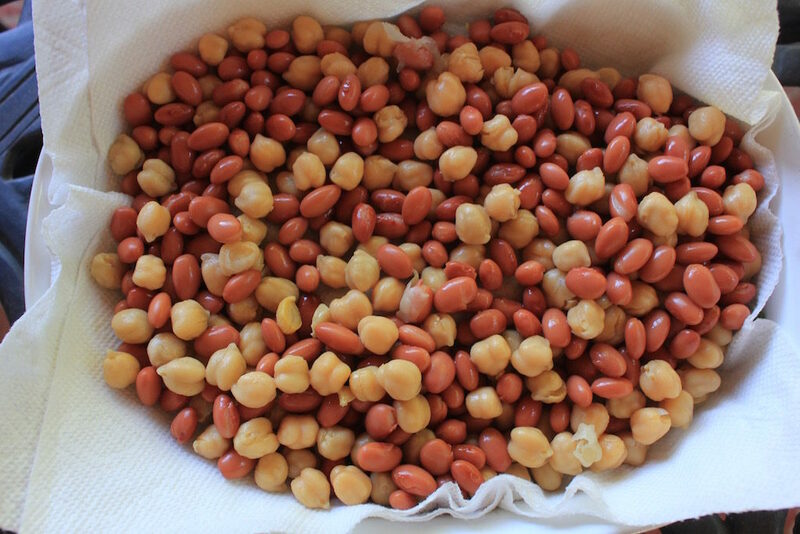 It’s typically made with three beans, canned green and wax beans and kidney beans, I add chickpeas to make that fourth bean. I also like to make this when the fresh beans are available in the summer. So nice to have that fresh flavor and a little texture in the green and wax beens from a quick blanch. To start, bring a large saucepot filled with cold water and a heaping tablespoon of Kosher salt to a boil. Trim and halve the beans. Plunge the beans into the boiling water and cook for three minutes. Remove the beans with a long-handled mesh strainer and plunge them into an ice bath. The beans retain a bit of a crunch, which makes for a nice texture in the salad. Drain and thoroughly rinse a can each of kidney beans and chickpeas. Drain the string beans. 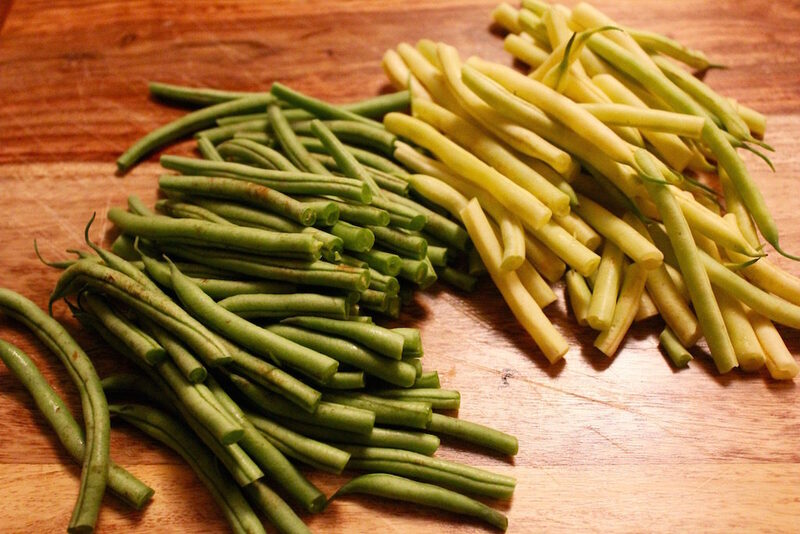 The beans are a bit moist and the excess water dilutes the vinaigrette; place some paper towels in the bottom of a two-quart serving bowl and dump in the string beans. Add some paper towel and cover with the kidney beans and chickpeas. It’s only water on the beans, the towels can be dried and repurposed. Slice the onion lengthwise into thin strips. If it’s a strong onion, don’t worry, the vinaigrette mellows the onion nicely. Whisk together the vinegar, oil, sugar, mustard, salt and pepper. Remove the paper towels leaving the beans in the bowl, add the onion and toss with the vinaigrette. Refrigerate for at least two hours, occasionally tossing to marinate all the beans. 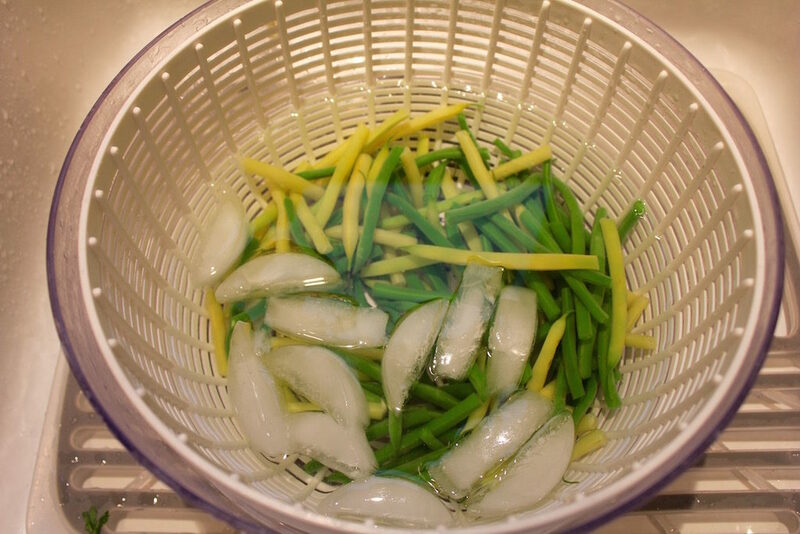 The salad can be made a day in advance, even though the dressing is slightly acidic it won’t turn the green beans that awful gray-green color. This is a great side dish, but don’t hesitate to have a bowlful for lunch! This salad can be made a day in advance, even though the dressing is slightly acidic it won’t turn the green beans that awful gray-green color. Eat as a side or as your main dish! Trim the beans and cut in half. Bring a pot of salted cold water to a boil, add the beans to the boiling water and cook for three minutes. Remove the beans with a long-handled mesh strainer into an ice-water bath. Drain the beans and place on paper towel to dry along with the kidney beans and chickpeas. Put the beans and onion in a large mixing bowl, drizzle with the vinaigrette and toss to coat. Cover and refrigerate at least two hours, tossing on occasion to marinate all the beans and onion.